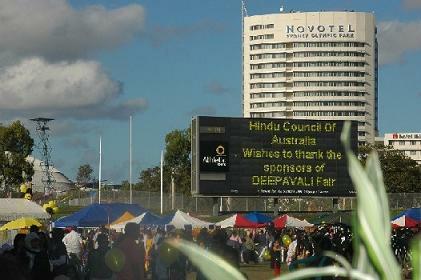 Hindu Council of Australia held a very successful Deepavali celebrations at the Sydney Olympic Park Athletic Centre on Saturday, the 30th October 2004. This year the event was held at a new venue and the visitors loved bigger and more open venue. It was a nice sunny day for people to enjoy the variety of cultural activities and the delicious Indian food from various regions of India. 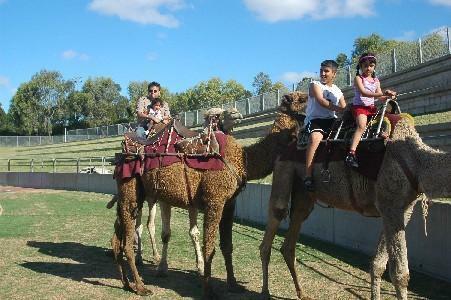 There were camel rides and other entertainment for children. A number of stalls were selling items, statues of Hindu Gods and Goddesses and Indian dresses suitable for the festive occasion. The Chief Guest was Hon. Philip Ruddock, Federal Attorney General of Australia. He appreciated the valuable contribution being made by the people of Indian origin to the multicultural Australian community by sharing the rich Hindu culture and traditions and also their valuable contribution in the economic development of Australia. As usual the function conclude with the burning of the effigy of Ravan, the Demon King, marking the victory of good over evil. Historic celebration of Deepavali at the Federal Parliament House – on 13th November 2004 for the first time in the history of Australia, Deepavali was celebrated at the Federal Parliament House in Canberra. It was a memorable moment for all Hindus living in Australia. It marked the recognition of one of our most important festivals as an important and significant event to be celebrated in multicultural Australia. Hindu Council of Australia took this initiative in our Deepavali fair in 2002 when we requested NSW Premier, Bob Carr to have Deepavali lighting and celebrations at the State Parliament. He agreed at that time and we had the first Deepavali celebration at the NSW State Parliament in 2003 and again in 2004 with lighting of the exterior of the Parliament. 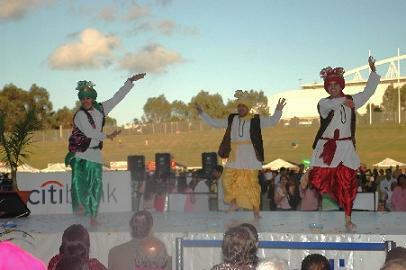 This year Hindu Council took a step further and the celebration was taken to Canberra. The Prime Minister was represented by Hon. Senator Gary Humphries and the Leader of the Opposition was represented by Hon. Senator Joe Ludwig. His Excellency Prabhat Shukla, High Commissioner for India also addressed the gathering. Punjabi Bhangra group was specially flown from India to perform at the function, courtesy of the High Commission of India and India council of Cultural Relations. The Great Hall was full to capacity. People came from Sydney and Melbourne and other nearby places and witnessed this historic event and took part in the celebrations. The exterior of the Parliament House was lighted for 3 days to mark this occasion.We sincerely hope that other State Parliaments in Australia will also be celebrating this function in years to come. Let Deepavali be celebrated all over Australia like the Christmas and the Chinese New Year. We sincerely hope that other State Parliaments in Australia will also be celebrating this function in years to come. Let Deepavali be celebrated all over Australia like the Christmas and the Chinese New Year.